Choosing the right bearings for your bike. Even as the forward march of technology makes our bikes more and more advanced, bicycles still rely on one of the most fundamental mechanical structures: the bearing. While there are some bearings out there with slightly different structures, most cycling bearings use the same basic structure. The bearing is made up of a few key parts. First, the core of any bearing is the ball bearings themselves. These can be made of a variety of materials (which we will discuss later in this article), each of which have their own advantages and disadvantages. The second key component is the race. This is the channel in which the bearings sit and travel. Most cycling bearings feature a steel race, though some do use a ceramic race (which we will briefly touch on later). Next there is the lubricant. Lubricants vary greatly in viscosity (thickness), finding varying points in a trade-off between bearing protection and lower friction. Lastly, there is the seal. Some bearings (such as those made by Hawk Racing) are fully sealed, and do not require any continued internal maintenance in order to maintain their efficiency. Other bearings are unsealed, and require regular maintenance to keep the bearing free of contaminants and operating smoothly. With fully sealed bearings, there are also multiple levels of seal the provide greater protection against contaminants for those riding in dirty or wet conditions. Why are Ceramic Bearings Popular? 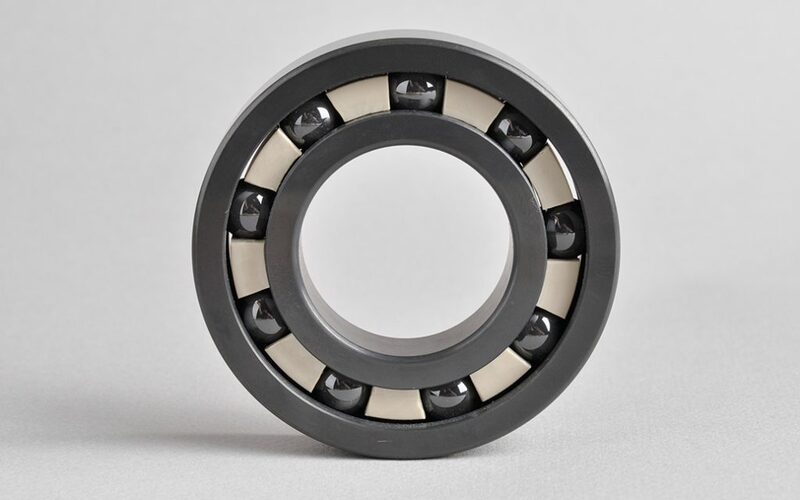 Originally developed for industrial uses, ceramic bearings are made from a non-metallic ceramic compound called ceramic silicon nitride (Si2N4). These bearings were invented to provide lower friction in high revolutions per minute (RPM) situations. This is due to the natural properties of the ceramic compound that provide a smoother, more uniform surface and size and a harder ball. These properties are perfect for the industrial applications they were originally designed for, and would appear to translate to cycling as well. So, what exactly are the benefits that riders see in ceramic bearings? First, ceramic bearings have lower friction while spinning at high RPM. Their smooth surface and uniform size distributes the load evenly across the balls and doesn’t cause added friction from imperfections on the surface of the balls. This translates into less wattage needed in order to spin the bearing. Second, well-made, high-quality ceramic bearings can have a significantly longer lifespan than the commonly used stock steel bearings that come installed on most production bikes. This is due to the hardness of the bearings. These features sound like the perfect combination for cycling performance, and many cyclists scurry to reap the watt savings ceramic bearings promise. But, are they really all they’re cut out to be? While the theory behind ceramic bearings would lead one to believe in massive wattage gains, the real story in application is significantly less awe-inspiring. The reason for this is simple: cycling is not what ceramic bearings were designed for. Ceramic bearings started life as industrial workhorses. Upon closer review, it becomes clear as to why this matters. Here are a few of the reasons in clearer detail. As I said in earlier paragraphs of this article, ceramic bearings get their wattage gains in high-RPM, low-load applications. When they are spinning incredibly fast without much force loaded onto them, the properties of ceramic really shine. However, as fast as an 130 RPM pedal cadence may feel, it is nothing compared to the speeds these bearings are made to operate under. Because ceramic bearings were designed to operate in industrial machinery, they are designed to get their biggest gains in the RPM range that most industrial applications operate. It may surprise you that this range is actually 10,000 RPM or greater, with some applications operating significantly higher than that. When slowed down to around 1% of its optimal range, the gains are now marginal. When Hope Technology considered moving to ceramic for their wheelsets, they found that the gains were just too small to justify the extra cost. Here’s what they had to say. They (ceramic bearings) do run with less friction, which offers a significant advantage in industrial applications running at 20,000 rpm. A tiny percentage reduction in friction here can equate to a worthwhile power saving, but when you're only turning at 300 rpm, as you do on a bicycle, a small percentage increase in efficiency will make a negligible change to your power output. Certainly not worth the significant increase in cost. Performance ceramic bearings have an enemy: grease. Grease lubricant is the most commonly used type of lubricant in the cycling industry because it provides consistent lubrication over a long period of time with little to no maintenance. However, ceramic bearings do not perform well when lubricated with grease lubricant. The added drag that ceramic has to overcome through grease that steel does not completely negates the wattage gains when all other factors are equal. So, how do ceramic manufacturers get around this? There are two possible solutions. First, you could run your bearings dry. The smoother, harder surfaces of ceramic bearings do allow them to run dry when used in the right conditions. However, cycling is not one of these conditions. Dry running bearings are used in industrial applications where there is very little load placed on them. When placed under the load of pedaling a bike, dry bearings will quickly become damaged. Ceramic bearing manufacturers take the remaining path, which is light oil. Light oil lubricants allow the ceramic bearings to glide smoothly without the damage or running dry or the resistance of grease. However, this comes at a cost. First, light oil needs to be regularly checked and replaced. If the oil isn’t just right in the bearing, the balls will wear, which means they need to be smoothed out and repacked. This maintenance comes at a steep financial cost for most riders who rely on paying local bike shops to service their bikes. In addition, ceramic bearings can’t be sealed due to the need for regular maintenance. This leaves the bearing vulnerable to contaminants, which can damage the bearing and reduce performance. Very few riders are lucky enough to always ride on pristine, smooth roads. The real world is a bumpy place, and every part of your bike feels it. While they seem incredibly hard, metals like steel have the ability to absorb a certain amount of impact by slightly changing shape temporarily before returning to their original shape. Ceramic, which is significantly harder, does not have this ability. When a bike with ceramic bearings goes over a bump, the ball bearing (which is harder than the steel race that contains it) strikes the inner surface of the race. This impact leaves a very small dent, or pit, in the steel race. Over time, these pits lead to a rough, noisy pedal stroke. Some ceramic bearing manufacturers solve this by building their race out of ceramic as well. While these full ceramic bearings don’t have a pitting issue, they do face problems with short lifespans and low durability due to the fact that they can’t flex and move with the bike and are forced to absorb constant impact without the ability to properly do so. Last (but certainly not least) in the discussion of ceramic bearings is the issue of price. Ceramic bearings are incredibly costly to manufacture in comparison to steel bearings. For the industrial applications they are designed for, this cost is offset by the increased lifespan and significant improvement in performance they provide. However, in the cycling world, these marginal gains represent a significantly higher cost to benefit ratio. A recent independent study conducted by the Friction Facts lab tested 35 of the leading steel and ceramic bearings to see how much power was lost to friction on each one. The results illustrate the cost to benefit ration nicely. The highest performing ceramic threaded bottom bracket outperformed the highest performing steel threaded bottom bracket (made by Hawk Racing) by less than 1%. However, the ceramic bearing costs just short of twice as much as the Hawk Racing bearing. The highest performing bearing made by CeramicSpeed was outperformed by the Hawk Racing steel bearings by almost 15%. However, it costs three times as much as the Hawk Racing bearing. When all of the factors are taken into consideration, ceramic bearings begin to lose a bit of their appeal. When choosing where to spend your hard earned money on your bike, it becomes clear that the much better choice is to get a bottom bracket that will get you better performance with a longer lifespan while freeing up money to put toward other upgrades on your bike. Hawk Racing sets the bar for steel alloy bearings. We use aerospace grade steel paired with our own proprietary lubricant to bring you bearings that provide industry leading performance at a fraction of the cost. Pair this with a maintenance free, sealed bearing structure and you have the perfect upgrade to take you to the next level of cycling, whatever that may be. Head on over and find the Hawk Racing bottom bracket for your bike. Unsure of which one works with your bike? Talk to your local bike shop, give us a call, or contact us via the form at the bottom of the page.